Ferragudo is a picturesque little fishing village, right on the Atlantic coast. Ferragudo has its own port and is also situated at the mouth of the river Arade. From Ferragudo you can enjoy magnificent views of the Atlantic Ocean, the River Arade and the city of Portimao. Here you will find holiday homes, holiday houses, apartments or holiday homes for your holiday in the Algarve. Here you will find all the offers in Ferragudo or the guidebook for the pleasant fishing village on the Atlantic coast. The city of Lagos has been ranked number one among the market leaders for holiday rentals, television and the press, with the "Top 15 of the holiday destinations" worldwide! Considerably shorter travel times from Faro airport to the resort of Lagos, make you want a day trip to the Atlantic and the west coast. The west coast with its rugged rock formations will reach you from your Lagos holiday home in minutes. 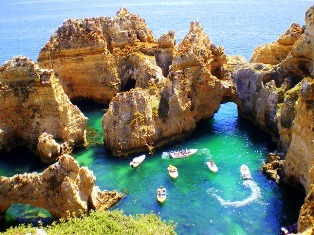 Here you will find all the offers in Lagos or if you are looking for a rental car in your Algarve holiday. Here we have a travel guide Lagos for you. Burgau is a small fishing village with a beautiful sandy beach, right on the Atlantic coast, Algarve, Portugal. Holiday apartment in Burgau. From their holiday accommodation in Burgau you can reach culture and history, nature and the west coast. Burgau is very family-friendly. The Quinta da Fortaleza belongs to the village of Burgau in the Algarve. We also have a small guide for the fishing village Burgau. Many regional dishes are carefully prepared in the restaurants of Burgau in a Cataplana. Here you will find all offers for a vacation rental in Burgau. Kite surfers, wind surfers and wave riders have now also joined the Algarve in their hearts. Many surfcamps offer accommodation, courses and tours.